Cleaning your mattress every 6 months to 1 year is the optimal way to maintain its condition. Other accidents such as stains, odors, water damage, and bed bugs may require immediate attention. In either event, we’re here to make the process quick, easy and affordable. It’s surprising to know that many people aren’t aware that you can clean a mattress. Like most other fabrics, mattresses soil over time, especially considering the average person spends about 1/3 of their life sleeping. This is much more time than one would wear a favorite t-shirt or outfit, and yet these items are typically laundered after each use. Your mattress can be sanitized in less time than it takes to wash a load of laundry. Online DIY information provides useful ways to clean a mattress, such as vacuuming, baking soda and enzymes. These are great neutralizers for specific stains; however, they must penetrate as deep as the stain and then be flushed and extracted out of your mattress properly to avoid mold and mildew. Clean Sleep’s Technology will do the heavy lifting for you and have your mattress cleaned and sanitized. Yes, WE can! Our Clean Sleep Technology is based on years of research for the best and most effective ways to clean mattresses. Clean Sleep provides a professional mattress-cleaning service like nothing you’ve seen before. Our process utilizes our patent-pending Clean Sleep Machine, which is a unique, one-of-a-kind process engineered and developed specifically for the purpose of cleaning and sanitizing mattresses. There are 5 important steps to our mattress cleaning system. Each step targets different ailments, but they all work together to make your home a cleaner, more comfortable space. Some upholstery and carpet cleaning companies offer mattress-cleaning services. These companies often improperly use equipment made for cleaning the carpet on your mattress, not to mention the unknown and potentially harmful chemical agents that some employ for cleaning. Furthermore, many of these leave your mattress wet and susceptible to mold and other fungal growth. There is also a risk with some of the do-it-yourself advice for mattress cleaning. Some sites offer up generic advice that could degrade the fabric of your mattress. Be careful not to make it worse. 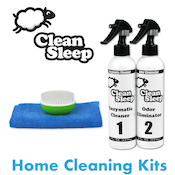 Clean Sleep is your professional mattress cleaner.